Be sure to check out our groups and classes! Sunday, April 28th ~ 1:15 p.m. Writer and activist Dr. Parker J. Palmer has long been at the forefront of applying grassroots efforts for improving the democratic process. In this session, Parker speaks with Tami Simon about the current state of national politics and what we can do on both micro and macro levels to improve the situation. Parker notes that even though it may seem as if anger rules the day, "It's not actually the politics of rage; it's the politics of the brokenhearted." Here, Parker teaches us that it's how we react to the million heartbreaks of everyday life that dictates the energy we put out into the world---an ultimately the health of our society as a whole. Lisa Wilhelm, a certified Hurqalya Healer is now offering ongoing healing sessions at Unity of Palmyra in our healing center. Her initial clinic hours will be on Saturday May 18th. To schedule an appointment, please contact Lisa at batinlhw777@outlook.com or 717-421-2340. 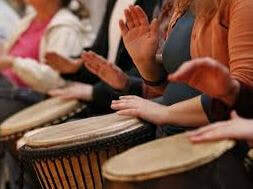 Bring your drum or other rhythm instrument., or just bring yourself and make a joyful noise! Electrical items must be in good working condition and include cords, chargers, and manuals in a ziplock bag attached to the item.